Growing peas is a good way to get an early start in the gardening season. The seeds of this vegetable thrive in cold temperatures. The plant draws attention to the garden with petite white or purple blooms, dainty-looking vines and bright-green plump pods. They are resilient, hardy and full of flavor. The plant comes in sizes right for any garden, from 12 inches tall to a promising 5 feet or more. Peas need little attention after planting and will produce abundantly. It is easy to grow sweet peas because you can plant them directly into the garden’s soil. Before sowing seeds, add plenty of organic material to improve the nutrient content of your dirt. Well-balanced nutrients and minerals are essential for the plants' survival. Plant the seeds in holes that are 2 inches deep and 4 to 6 inches apart. They develop best in deep, rich, moist but well-drained soil that is exposed to full or partial sun. To quicken the germination of the seed, cut the outer seed shell with a nail clipper. Sow seeds into moist dirt and water thoroughly until they sprout. New shoots rise above the soil as roots plunge into the earth, where they begin soaking up water and nutrients. Water frequently to encourage growth. When seedlings are 3 to 4 inches high, thin them by plucking weaker, smaller shoots, leaving the most vigorous plants 4 to 6 inches apart. The plants will soon grow into vines that crawl up trellises and produce flowers and pods. Plants need the most water when they begin flowering and producing pods. As the temperatures increase toward summer, water daily to keep up the plants' production. Pods are ready for harvest when they are full, and the outer layer of the pod is tight around the peas. 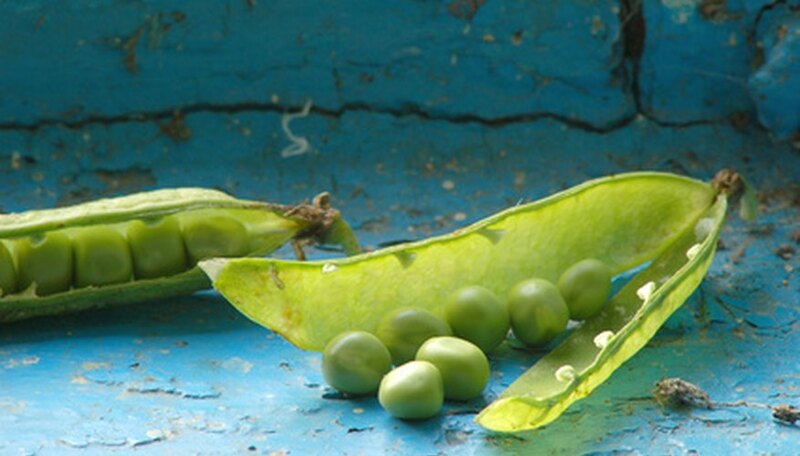 For softer-shelled peas, such as the snow pea, harvest when the pod reaches 3 inches long. Yellow lifeless leaves are the first signs of fusarium wilt and root-rot disease. Infection in older plants results in inadequately filled pods. These diseases are not as common when peas are planted in well-drained soils. Raised garden beds amended with rich organic material can significantly increase soil ventilation and drainage.